Online marketing and Google Ads - the two go hand in hand. When a prospective customer is looking for a product, restaurant, service, promotion, or anything from anywhere in the world, they’re likely going to search for it on Google first. That's how Google Ads work: someone enters a search term and Google serves them a relevant ad for a product or service. In the world of business, Google Ads can be a hugely successful tool for driving traffic, marketing your product, and getting sales. If you've been ignoring the most popular (and effective) online advertising platform in the world, it's time for you to take a second look. In this article I'll show you 12 reasons why Google Ads will help you reach new customers and grow your business; as well as share 3 top tips for getting the most out of your ad budget. But as a small business hoping to organically get on the top ten search results, you have to recognize you’re competing with career-long, experienced, motivated SEO experts. But with Google AdWords you can compete on the same level, no matter how long you've been around or your own expertise. You can get your message viewed by your market, exactly when they’re searching for your specific product, service or offers. AdWords enables you to easily target countries, areas within a country, and radius targeting (to show your ads to people within a certain distance to your business). 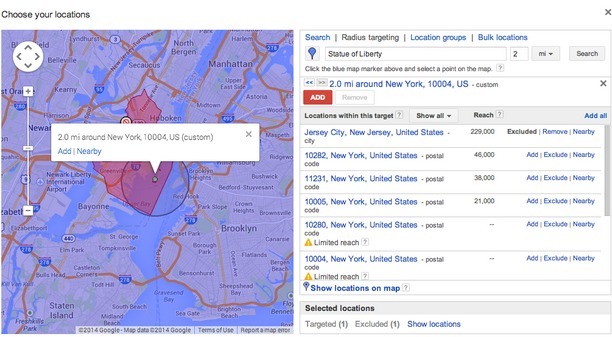 You can exclude locations, too, even in your proximity targeting. Excluding locations brings your ROI up by lowering costs and targeting more precisely. You can also target by geo-based demographics such as income level. 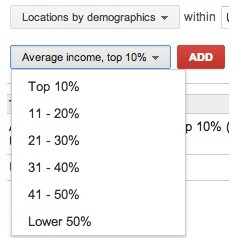 So, if you’re selling luxury goods you can target the top 10% income earners in your specified area. By using Google Places in conjunction with AdWords, you can show a map of your brick-and-mortar shop with your ads. The easier you make it for customers to find you, the more likely they’ll walk in. You’ve probably seen ad extensions on ads everywhere, but you might not have known how they worked. By including more contact information in your ads, ad extensions make it way easier for your potential customer to connect with you. Tim Hortons adds their nearest address. They link to their “nutrition” “coffee” “Tim Card offers” and “location” pages on their website, so people can click directly through for more information. If you're going to localize your Google Adwords campaigns, be sure you're localizing the ad's corresponding landing page as well. There's no point in driving traffic interested in seeing brick-and-mortar results in their area to a generic site not optimized to receive them. Keywords, keywords, keywords. This is what Google AdWords is known for. The more targeted your keywords (and keyword phrases) are the better Google will rank your ad. You’ll also reach a lot more consumers who want exactly what you have right now. 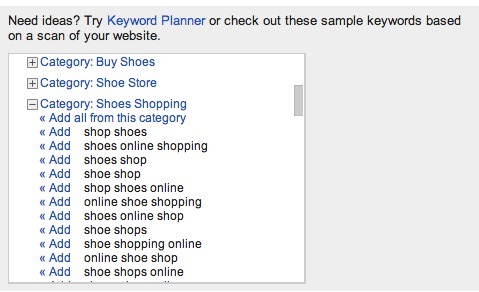 If you’re using Google AdWords directly, be sure to research through suggested keywords for every ad group you create. Some Google ad providers offer to do the hard work for you by choosing the most optimized, targeted keywords for your ad group campaigns. Use the opportunity to think like your customer, and choose words they’re searching for. You can set up different keywords for each of your ad group campaigns. And you can change your words at any time to keep optimizing your reach. You’ve seen it, I’m sure. You visit a site, stay on it for a while, and then leave. But then you keep seeing ads for the company, or even the product page you were on. That’s retargeting. With Google Adwords, if an interested customer has visited your website, they get a cookie from a code you’ve put on the backend of your site. When they leave your site, you can target your ads to follow them on the Google Display Networks, or Google search. You pay extra for it but it really does work to increase sales. Think about it... Those people were interested enough to come visit your site. You can get seen by them again - and then again and again - while you’re business is still on their mind. Let's say you have a baby products store. An interested parent-to-be clicks on your ad and visits your landing page for strollers. In doing so, their browser picks up your Google AdWords cookie. They leave to do some more shopping around. And yet, when they visit (for instance) a popular parent blog site (which is part of the Google Display Network) they see your ad for strollers again. And again when they go to YouTube. Particularly with "shopping around" prospective customers, the simple fact that they see your logo, brand name and offer more frequently than your competitors translates to increased sales. Your customer might be right outside your door when they’re searching for your products or service. Google AdWords gives you loads of mobile optimization options and allows you to target with both text ads and image ads. 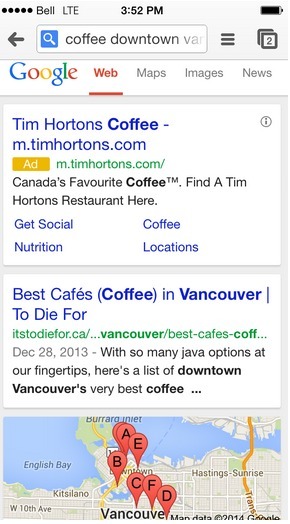 For example, if you market a local coffee shop mobile ads are a perfect fit. Your customer might be looking for their caffeine fix while they are walking through your neighborhood. They search for places nearby and your mobile optimized ad shows up first. You get a new customer in your door, just like that. Google has tons and tons of ad partners. You’ve may have read a blog in your own marketing niche, and seen ads specific to that niche. More than likely that blog is part of the Google Display network. What does that mean for you? Well, it makes it easy for you to advertise on popular niche sites - where your customers are. You can track your results and even exclude sites that aren’t performing as well as you’d like. I’d suggest that if you’re just starting out on Google AdWords, you use the Search and Display option as it gives you a broader reach. As you get used to how Google AdWords work and you’re seeing an increased result in your click throughs, then narrow an ad campaign to the Display Network only. Monitor your results, and improve your ads as you go. You can also connect your website Google Analytics in order to see what pages your ad traffic is visiting within your site. Here's Google's guide on how to do that. You can make your results reports as simple or as complex as you want. So, for people who don’t want to spend all day sorting through ad data, that’s ok too! If you’re a small, local business you may be more familiar with offline advertising methods. If so, you’re likely paying a set fee for each ad you publish or run. And you’ve likely used to signing a contract too, agreeing to run "X" number of ads for "X" amount of money. With Google AdWords though, you can set your budget for each ad you run - and you can change it whenever you want. If an ad is performing really well you can increase your results by increasing your ad spend. If it's underperforming (low impressions, low clickthroughs, etc) decrease ad spend or stop it and test something. Simple! Note: Your daily cost is based on a daily average per month, so don’t be alarmed if yours varies from day to day. I’d recommend starting out with a budget of $20-40 per day. When your ad is live, track it to measure your results. Adjust your budget based on your ads’ ROI - or whatever your particular objectives are for your campaign. A really cool thing about Google Ads is that your can run a whole bunch of different ad campaigns for a whole bunch of your marketing objectives. You could set up thre different marketing campaigns - one for each of your targeted services. 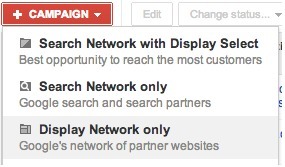 You can then set up multiple ad groups for each campaign. In your ad groups, you can target with different keywords. Then you can make two ads for each ad group so that you can A/B test to find which ad performs best. Okay, this may seem a bit complicated at first. But, once you get the hang of it, it’s actually quite cool and it gets you results. Check out my guide to a/b testing your Google Adwords campaigns if you're curious. Unlike any offline advertising you’re doing it’s very simple to monitor your real ROI on Google AdWords. It’s also pretty simple to tweak your ad copy to get better results, and improve your profits. A mantra of mine is "there's no point driving traffic to a site that's not optimized to receive it, but there's equally no point in optimizing a site that's not receiving traffic." In other words, you can spend all this money and time on your adwords campaign, but unless the page you're sending people to is optimized, you're wasting all of it. Match your Adwords headline to your landing page headline. Simple, but effective. Ensure your landing page's CTA contrasts clearly from the rest of the page so people know how and where to engage. Keep your landing page simple and to the point. Make sure the selling point (also called USP) in your Google Adword campaign is the same as your landing page. For more on landing page optimization, check out How Do I Build a Landing Page for Google Adwords? Of course that six week period is entirely up to you. Some small businesses find it worthwhile to test/optimize more frequently, some like to leave a campaign running for longer. Six weeks is just what we've found gives us the clearest results. For example, if your offer is a coupon for a Thai restaurant and your market is busy families, use words like “busy schedules” or “healthy dinner options”. Alternatively, if your current promotion is being targeted to university students, consider keywords like “cheap pizza,” “big slices,” and emphasize that you deliver and are open late. In short, think like your audience above all else. But there's no point in starting a marketing strategy unless you know what you're doing, so education is key. I hope this guide has helped in that regard. What do you think? Do you use Google AdWords for your business? What successes have you had?